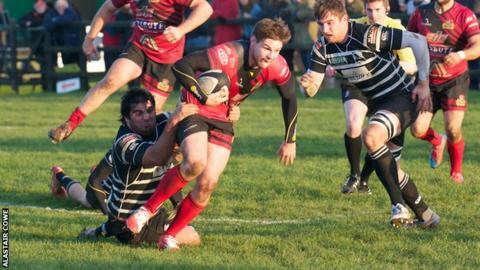 Redruth head coach Steve Larkins says he was "generally pleased" with how his side played in their 33-21 loss at Chinnor in National Two South. The defeat was a fifth in six games for the Reds and a third reverse in a row. "There're not many games where you'll give away three interception tries and win a game," Larkins told BBC Cornwall. "It was disappointing on that area of the game, but generally we were pretty pleased with the way we took the game to them and we tried to keep playing." The loss sees Redruth slip to 12th in National Two South, below Cornish rivals Launceston, who went 10th following their win over Canterbury. Centre Nielson Webber was forced to play at scrum-half after an injury to first-choice Greg Goodfellow, but Larkins was impressed with how he adapted. "It's his first game for a couple of years at nine and he played quite well - he set up a try just before half-time," he said.